Written by Tom Ewer on July 4, 2014 Blog. When running an online store, it’s not enough to offer a great product. That’s a good place to start, of course, but there’s actually more to it than that if you really want to be successful. One of the most important factors is offering high-quality customer support. Regardless of your industry and no matter what you sell, making your customers feel like their concerns are valid and that they can receive assistance when they need it is crucial. Make a customer feel valued and special and you create a customer for life. Here, let’s look first at a few of the top reasons why you need to make customer service a priority and then highlight five broad ways you can put such a system in place. The first two reasons you need good customer support are inextricably linked. Quite simply, being there for your customers when they need you is good for business. It can improve your overall reputation and can drive customers to do business with you again in the future. Think about it: how many times have you seen a story floating around about a company that handled customer service so horribly wrong that the incident went viral? By being there for your customers, you help to prevent issues like this from happening. And doing this on a consistent basis has the nice side effect of increasing your customer retention rate. People are more likely to patronize a place repeatedly if their customer service experience was positive. Zappos is an oft-cited example who knock it out of the park over and over again. Not only does this company provide exemplary customer service; it also goes above and beyond what is called for. For instance, one time a customer ordered six pairs of shoes for her mother who had just had a medical treatment that left her feet sensitive and oftentimes painful. She ended up returning several pairs of shoes and Zappos responded by sending a bouquet of flowers and upgrading the customer, her mother, and sister to Zappos VIP Members, which offers expedited shipping as a benefit. Good customer support also makes your company more appealing to potential customers. It’s all about that reputation thing I mentioned above: if you have a reputation for being easy to work with, people will flock to you, even if that means paying a slightly higher premium. The more information you provide your customers upfront, the better. This means building robust resources and/or FAQs. Doing this shows you anticipate your customer’s questions — thus know them — and that you cared enough to take the time to put it together. We offer comprehensive documentation for WooCommerce to keep our customers informed. If your field requires more user discussion, a plugin like CM Answers might be beneficial since it permits users to ask and answer each other’s questions without needing to set up a complex forum. A regularly updated blog can act as an excellent resource for customers as well. It can keep them up to date on the latest company news, product announcements, and coupons. Plus, it provides a place for you to put your products in context. Share how-to information, background info, and so forth to build customer trust in your brand. Think of it this way: the fewer times you require your customers to leave your site to find the information they need, the more likely it is they’ll complete the sale. Another way to build a robust customer support system is to make it very easy for customers to get in touch with you. One way to accomplish this is to provide a contact form in multiple places on your site. A standard contact page is a good idea but it may be wise to add one to the sidebar and to the bottom of specific pages as well. The Jetpack plugin offers a contact form module that’s simple to set up and effective. 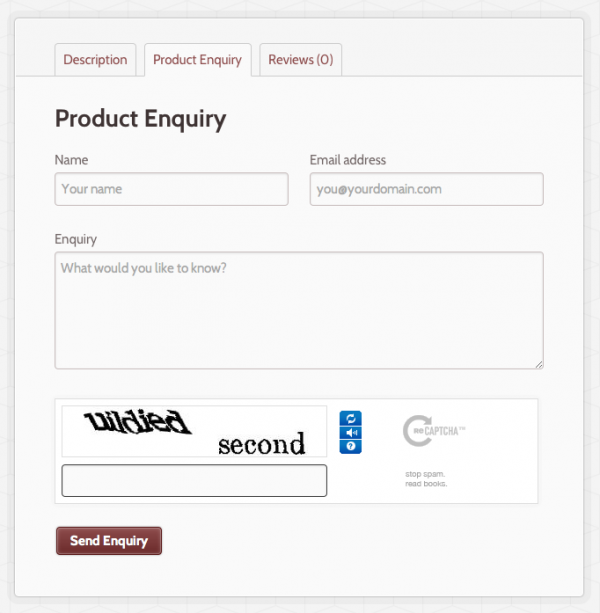 But if your products are a bit more complex and you anticipate specific questions about them, you might find the WooCommerce extension Product Enquiry Form useful. It works by adding a tab to the product details pages that features a reCAPTCHA form, allowing customers to pose questions directly. But what about after someone becomes a customer? Showing you care even after they’ve made a purchase plays a big part in retention. Many companies find success with email newsletters. You can set up an automated email marketing schedule with the Follow up Emails extension. Once it’s set up, you can make sure customers receive emails from you on a pre-defined schedule. You can include coupons, discounts, and whatever other information you’d like in these emails and it includes full reporting so you can keep tabs on what’s effective. The extension also allows you to include personalized customer and order data, which is important for building further trust. Sometimes things go wrong. It’s an inevitable part of life, so it makes sense that it would apply to businesses as well. But having a system in place that allows customers to reach out for help when they need it can make all the difference. We have the Help Desk to take care of your specific needs. Other sites provide support tickets that allow you to track the status of your inquiry. A few examples include WP Awesome Support – Responsive Ticket System and wpsc Support Tickets. While social media is often thought of as a marketing tactic, it plays a large role in customer service, too. In fact, being active on social media and using it to regularly converse with customers can have a direct impact on how your brand is perceived. Even if you offer a good product and have good on-site customer support, a social media misstep could tarnish your good name. Take for instance when a customer called out American Airlines on Twitter for offering sub-par service; the company responded with an automated tweet that read “Thanks for your support!” Not exactly a personal touch, no? And the company got a ton of flack for not taking customer concerns seriously. All the more reason to take social media seriously if you want to truly be there for your customers. Here at WooThemes we don’t always get it perfect, but we continually try our damnedest, and that is perhaps the most important factor of providing quality customer service. Companies need to want to do a good job. They need to understand that what the customer wants is important. And bending over backwards to make that happen can spell the difference between a one-time sale and a life-long customer. 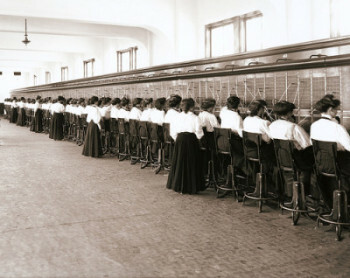 Do you have a customer support system in place for your online business? Do you implement any of the strategies described above? Or, do you take a different approach? As always, I’d love to hear what you think and what ideas you’ve found to be effective in managing your customers’ needs. – FAQs and Resources: always important to have, but do not expect your customers to read them. They will definitely save you typing time, but expect having to send links to the articles over and over again. – Contact forms: do NOT use captcha. Spammers can easily bypass it and it will annoy your customers. Invest in a good antispam solution instead (but beware of false positives). – Support systems: keep it separate from your site. Investing in a good 3rd party platform will be the best choice you will make. Just because a framework (such as WordPress) can also handle tickets, that doesn’t mean that it should be used for it. Note: adding affiliate links to the article, such as the one to WP Awesome Support, makes it look biased and less professional. Along with support, it is also important that how you treat them. If you make them feel special trust me they would never go to your competitors. So also provide some focus on it. Try to surprise them with small gifts and they will be happy. Some thing like a thank you card or a small gift would do wonders. I read this article and all information very helpful for how to offer top-notch customer support for e- commerce Site.